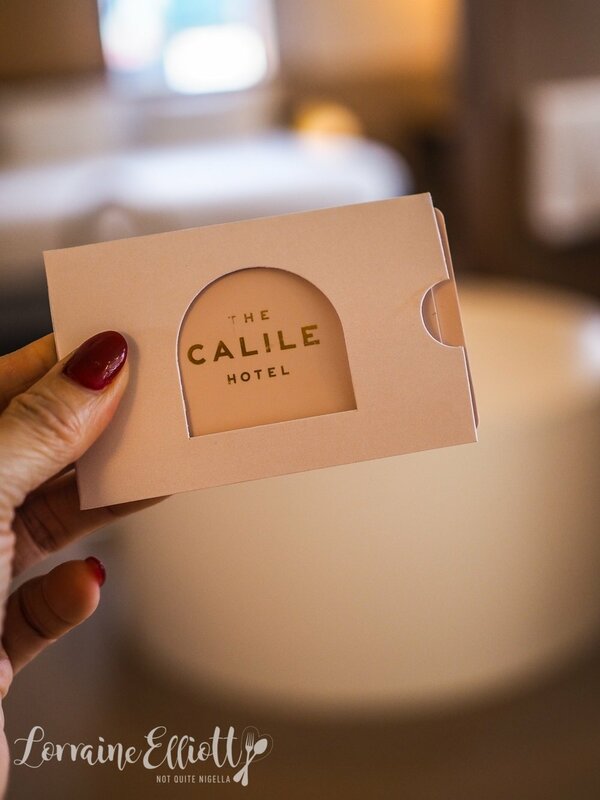 With a sorbet coloured palette of rooms to choose from, the new Calile Hotel blends function with form and thoughtful details. 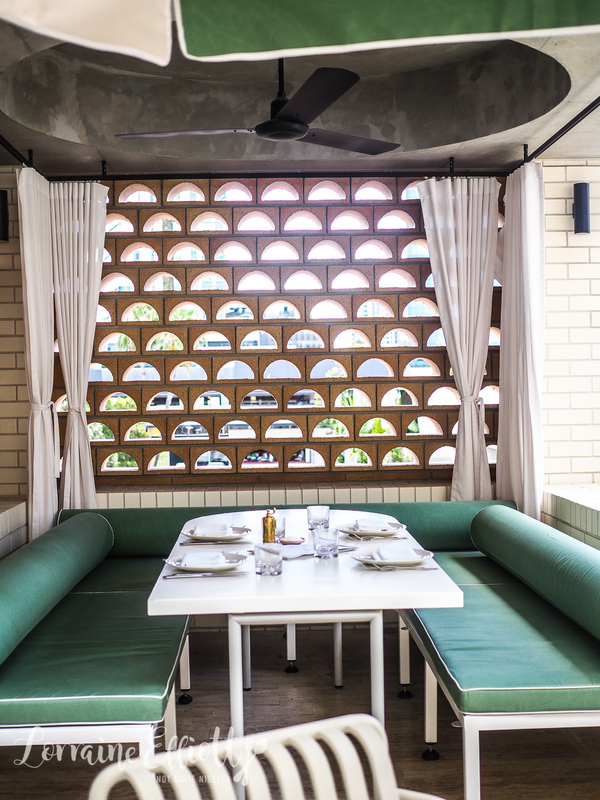 Located in the buzzy Fortitude Valley area on James Street The Calile is chic and modern with a Palm Springs vibe courtesy of the retro style pastels, white bricks and palm trees. OK first things first: Calile is pronounced "Kal-Isle" like California Island. It's actually a family owned hotel, the Malouf family developing much of the surrounding precinct in the Fortitude Valley. That development gives everything a theme and a polish. 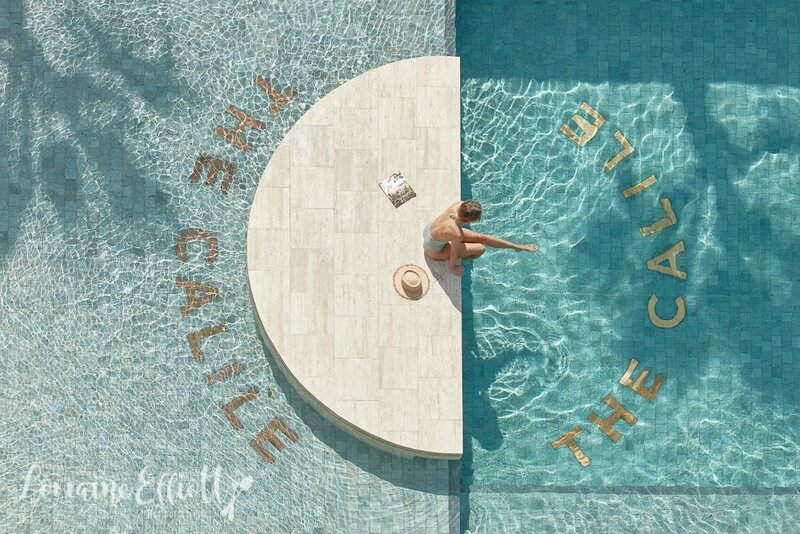 Calile is actually the Christian name of the family patriarch Khalil Malouf who arrived in Australia from Lebanon in 1892 four generations ago and the name has been passed onto subsequent generations. It is managed by TFE Hotel Collection. 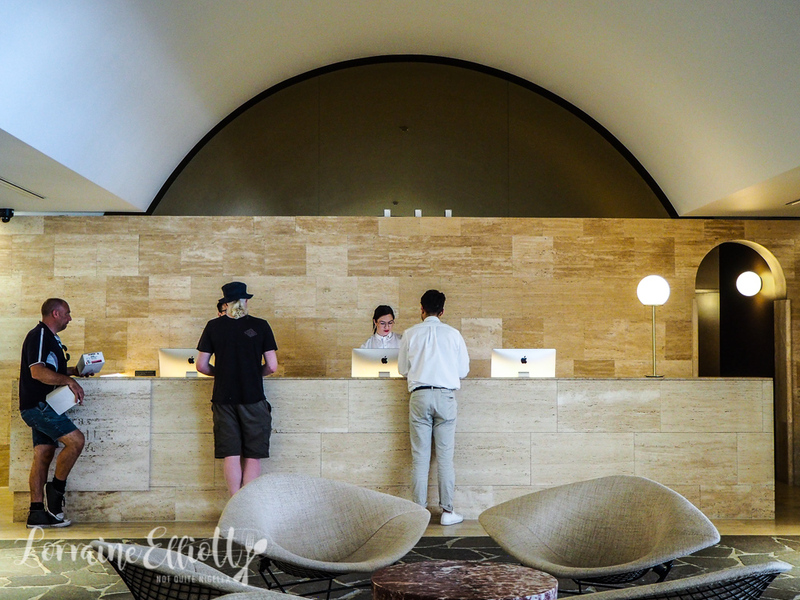 Check in is smooth and staff are lovely and welcoming. I'm staying in room #235 on the second floor of the 6 floor hotel. 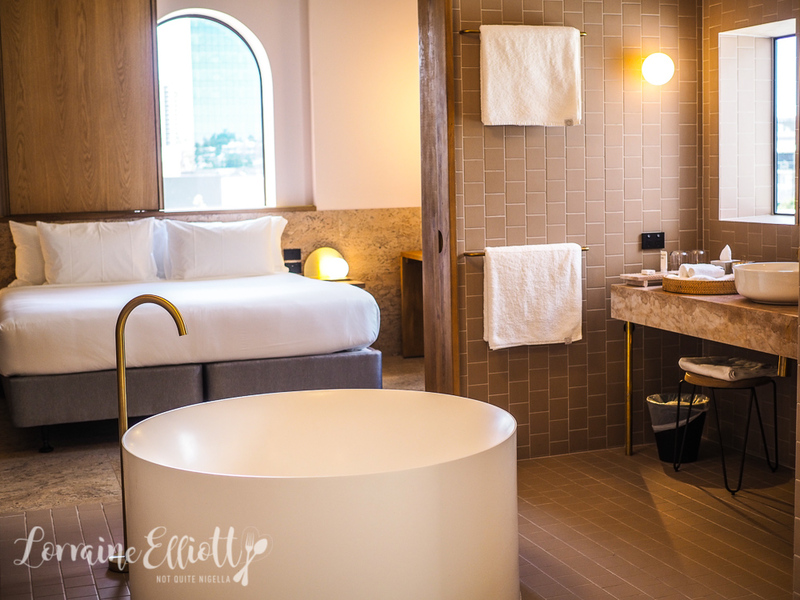 Mine is a deluxe suite, one of the hotel's 9 suites from the 175 room inventory. Most rooms have balconies, even the entry level ones have a Juliet balcony and this one has a rounded balcony with bar stools and a marble table. 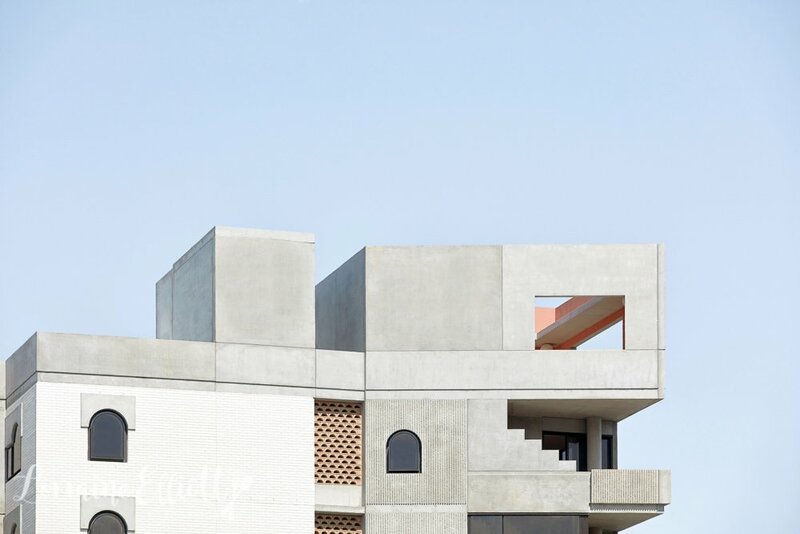 There are traditional feminine touches courtesy of the pastel shades as well as traditional masculine material like travertine marble, concrete and brass. My suite opens up to the bar area with the suite's mini bar made up of locally sourced Australian items including chocolate coated blueberries, Dello Mano brownies, Australian wines and Everleigh bottling Co. cocktails. 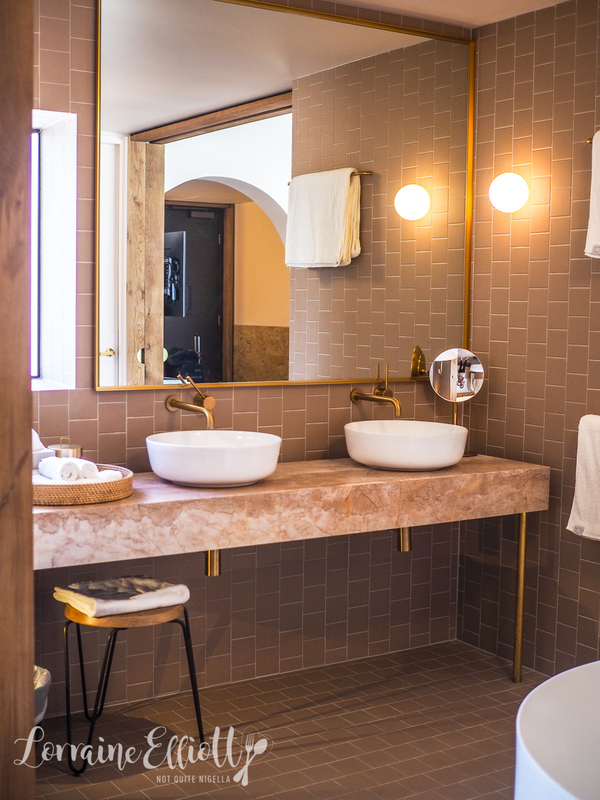 All rooms are one of three colours: pastel pink, green and blue with the marble, leather, and tiles reflecting that colour. 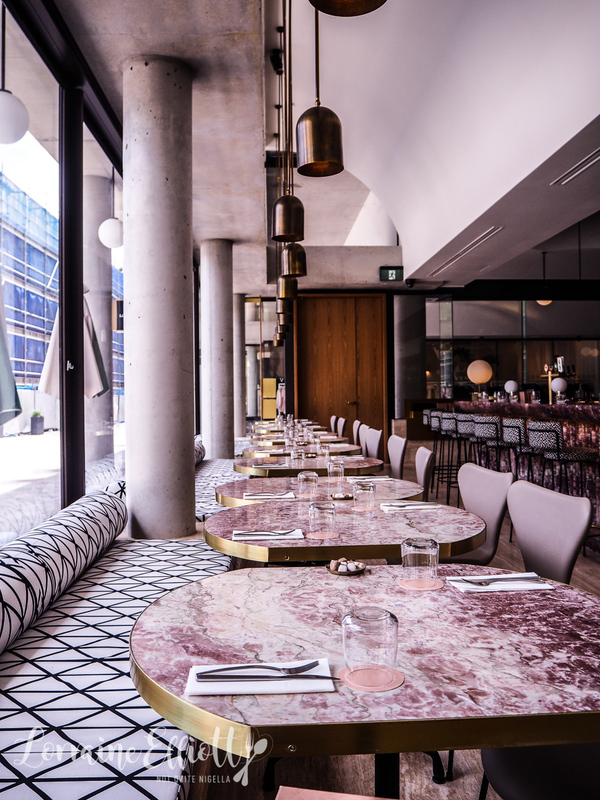 There is a large pink marble dining table and chairs and a banquette on one side. This leads into the bathroom with a circular bath as the centrepiece of the whole room. I find big hotel baths difficult to resist and I look forward to sinking deep into this tub. There is also dual sinks and amenities by Grown Alchemist. Stylish neutral linen robes are by Australian brand Venroy and there are matching slippers in the drawer. The bedroom has a large king sized bed with smooth sheets and well placed charge/USB points. The king sized bed is comfortable and there is also a choice of six pillows available from the room service pillow menu. Internet is fast and free for up to 4 devices. They do things a bit differently here - for example, traditional compendiums are a booklet covered with a fold out map of the area-they want guests to explore Fortitude Valley with its range of boutiques and eateries. There is also an excellent amount of space for luggage with generously sized wardrobes enough for two large suitcases and a small one. There are also green initiatives. 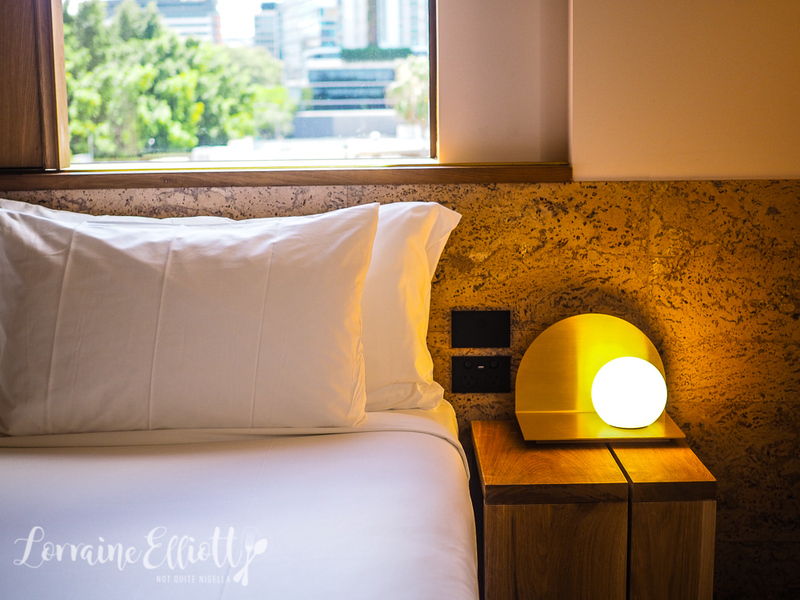 The air conditioning system has motion sensors that detect when you are in your room. When you depart, the air conditioning senses this and powers off and as soon as you walk back in, it turns on. And in every room there's a carafe and glasses and on every floor there is filtered water tap. The sultry weather in Brisbane means that the floor corridors are all open and naturally ventilated. It's a popular hotel for weddings as The Calile has its own amphitheatre. This is next to the pool, perhaps one of the most Instagrammed spots in the hotel. People perch on the ledge and take a photo from high up. The pool is only reserved for hotel guests during the day who can also order food and drink from the Hellenika restaurant and sit in the cabanas or on the sun lounges. Downstairs is also where the gym is located and on Wednesday mornings at 6am they hold a complimentary yoga class at the amphitheatre with their resident fitness trainer and Lululemon ambassador. Hellenika is the Greek restaurant alongside the pool and next to this is the Kailo spa. And a little tip: Hellenika is a very, very popular restaurant that is booked up for months ahead for Friday and Saturday night (it is at capacity on the Monday night I visited). I'll have a more detailed review on Hellenika in a separate upcoming post. 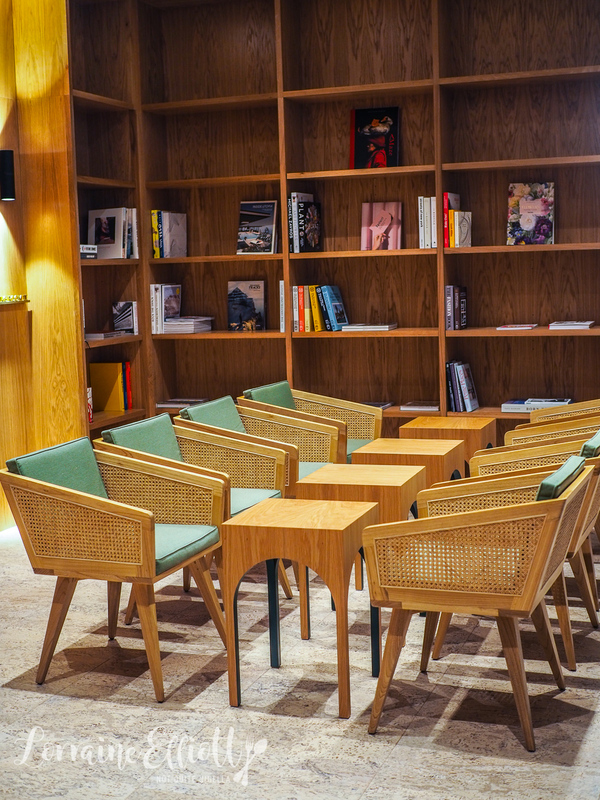 Breakfast is at The Calile's lobby bar with a menu of items to choose from from granola, artisan sourdough with preserves and some egg dishes and salmon confit with onsen egg on a bagel. 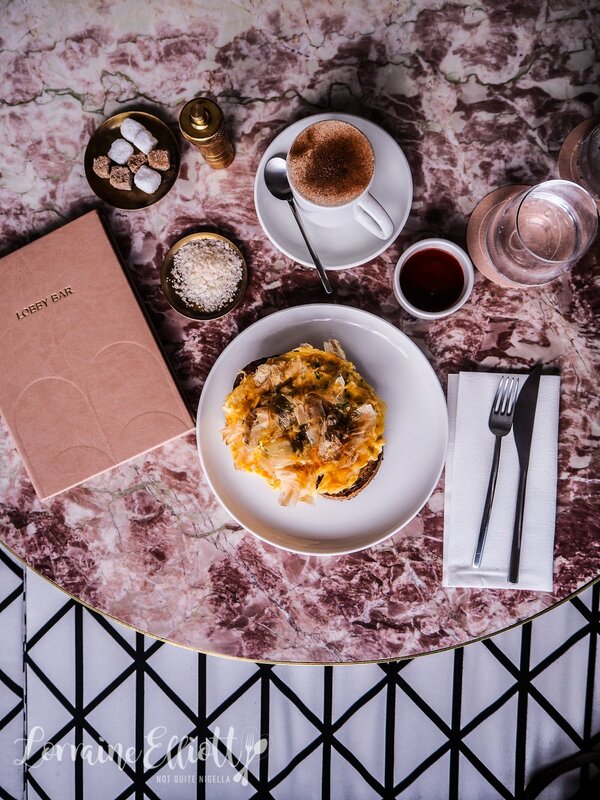 I go for the broken omelette with spanner crab, jalapeno and bonito flakes on top with a bit of extra Sriracha to wake me up. It's delicious and definitely a cut above normal breakfast offerings. 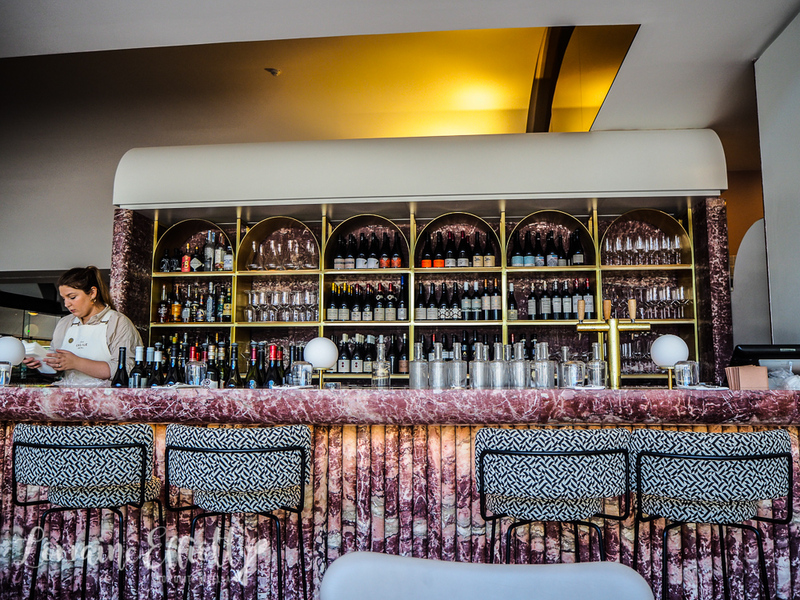 I sip an excellent chai latte basking in the warm blush of the pink marble bar. 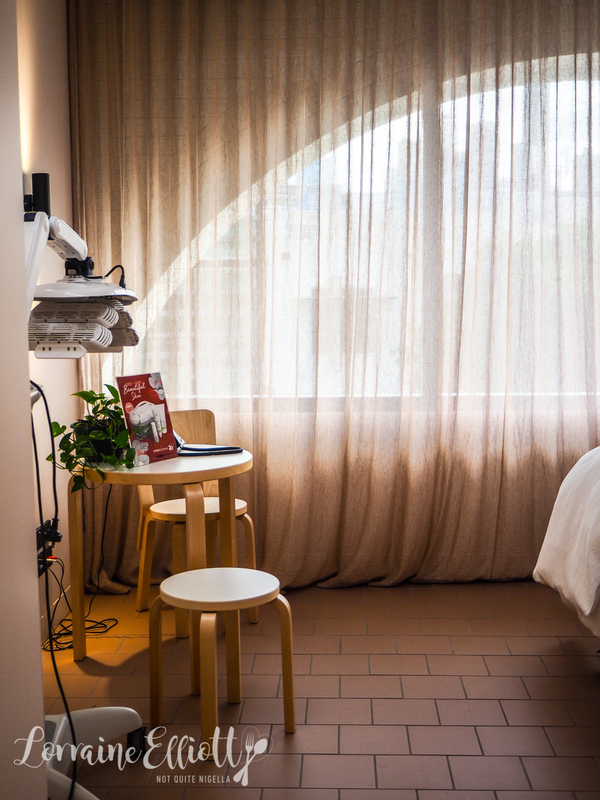 And if you're looking to buy a gift just next to reception, stop by the Museum of Small Things, the hotel's gift shop that has a collection of fantastic gifts and treasures from silk pillowcases, cute socks, notebooks and skincare gifts. 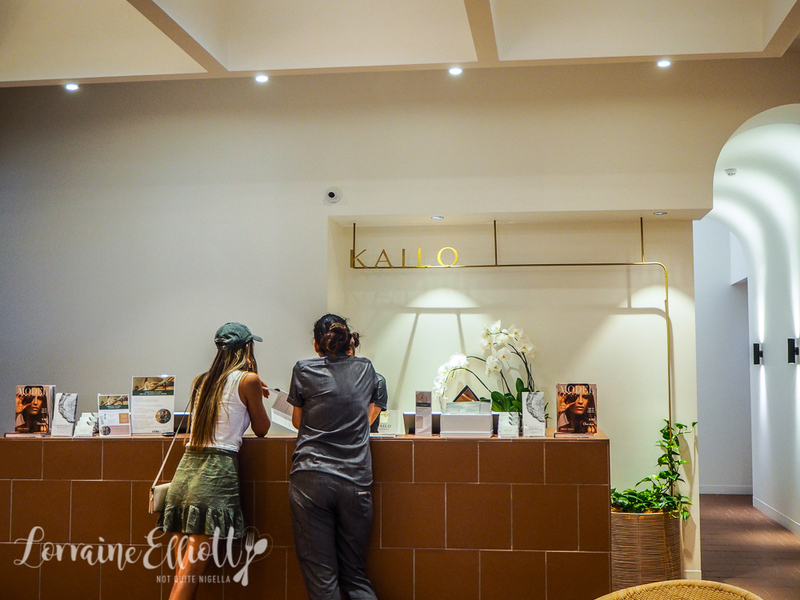 Later that day I head to the Kailo spa for a spa treatment. 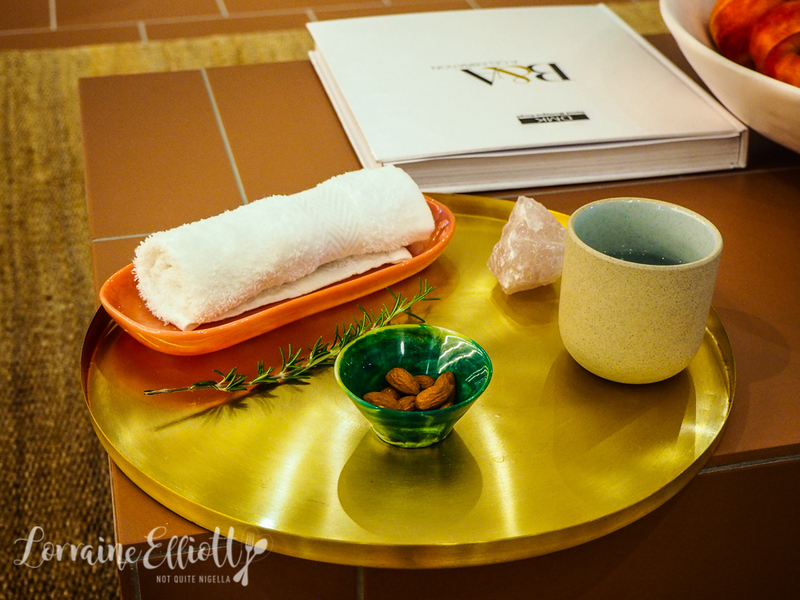 The Kailo spa on level 1 is also a wellness medispa created by four women: Dr Edwina Morgan, Meaghan South, Kristy Park and Kathryn Merlo. 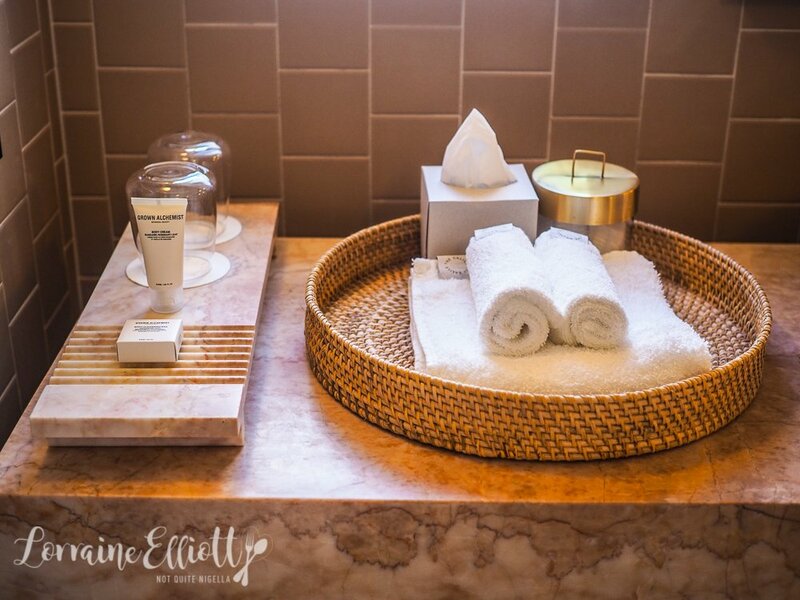 There are 7 spa treatment rooms and 3 spa wellness pods and offers an impressive 25 types of facials and 6 types of massage. There are also treatments that target specific skin types like Asian skin which can react differently to products eg hyperpigmentation. 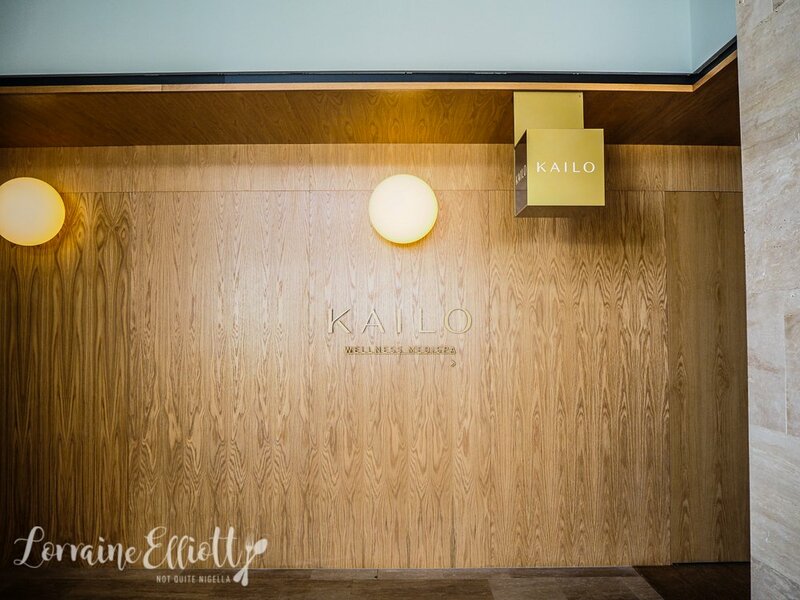 Kailo is the word for wholeness and good omen in an early Indo-European dialect. I'm booked in for a facial with therapist Astrid using DMK or Danne Montague-King products. I'm having the DMK Signature Enzyme Treatment. Astrid sits and consults with me giving me an overview of the treatment before asking me if I would like to have a look at my skin under the observatory which is a photographic light that shows the skin in more detail. Then we move onto the facial where she applies a range of DMK products. These are all produced without additional fragrance and this facial is a performance or a results based facial rather than a sit back and fall into a deep sleep one - if you haven't had this sort of facial before it is quite unlike any others. The mask sets hard but in a different way-first timers are not left alone because it is an unusual sensation. Astrid also does an extensive foot massage for 30 minutes while the mask is hardening. Dinner that evening is back at the lobby bar which must have some of the nicest staff in Brisbane. I start with a Passionfruit Tommy’s cocktail with Calle 23, boiron, passion fruit coulis, agave and candied orange. It's a gorgeous sweet, fruity number. 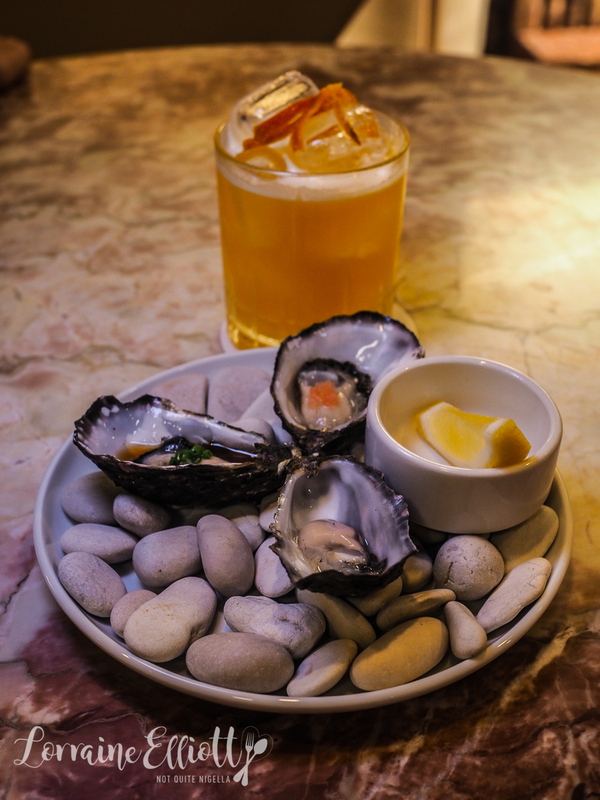 I have this with one of each of the oysters: there's a natural oyster with lemon, one with sweet umeshu and pops of finger lime and a savoury one with ponzu and chives. They're all entirely different propositions but no less delicious than the other. Chef Joel Walker is expanding the menu to triple its current size and it will focus on Japanese, French and Italian cuisines. 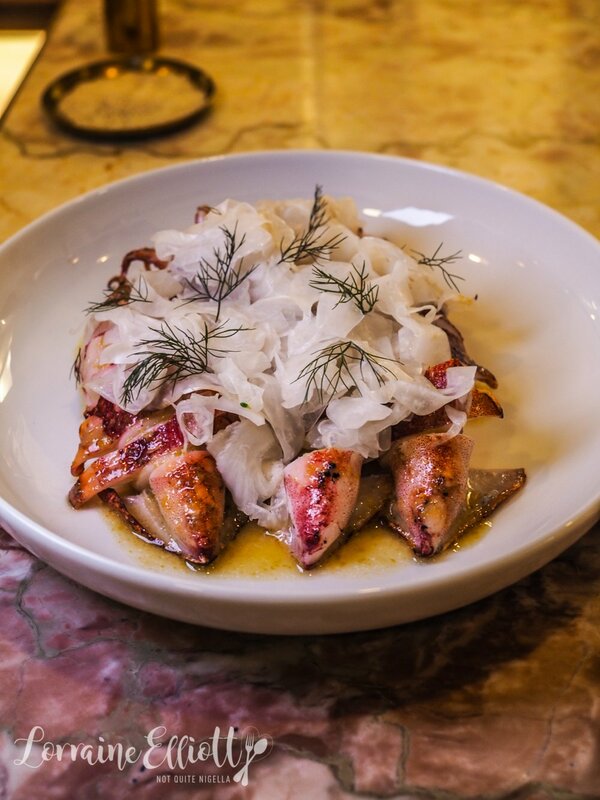 The calamari is two whole calamari sliced up and topped with a spicy, piquant yuzukosho (yuzu and chilli condiment) and thinly shaved sweet pickled fennel that gives the tender calamari an appealingly sweet spiciness. It's bold but sweet and a good sized serve. It's apparently a guest favourite menu item. I also adore the dry aged wagyu beef that is slow cooked for 20 hours and then finished on the grill. 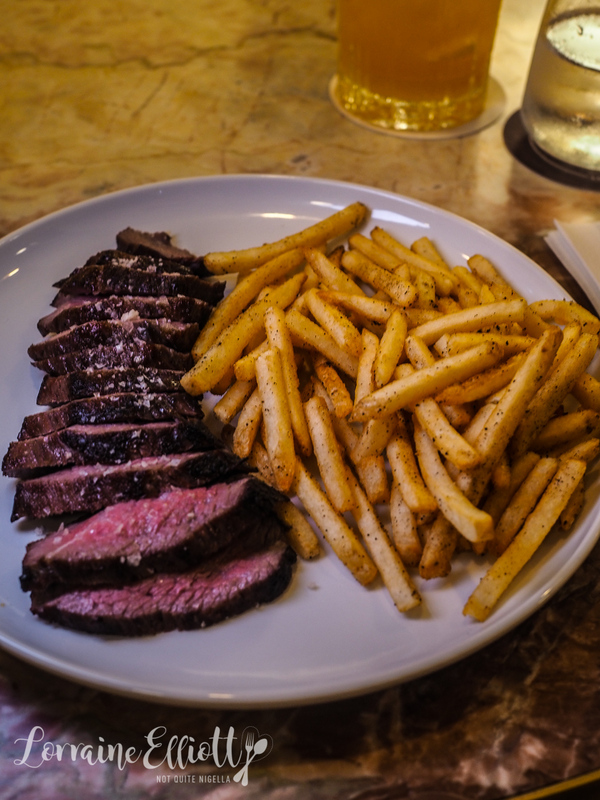 It has a fantastic, savoury/umami flavour to it with the dry ageing and is paired with kombu salt dusted French fries. The roasted broccoli is apparently the staff favourite. 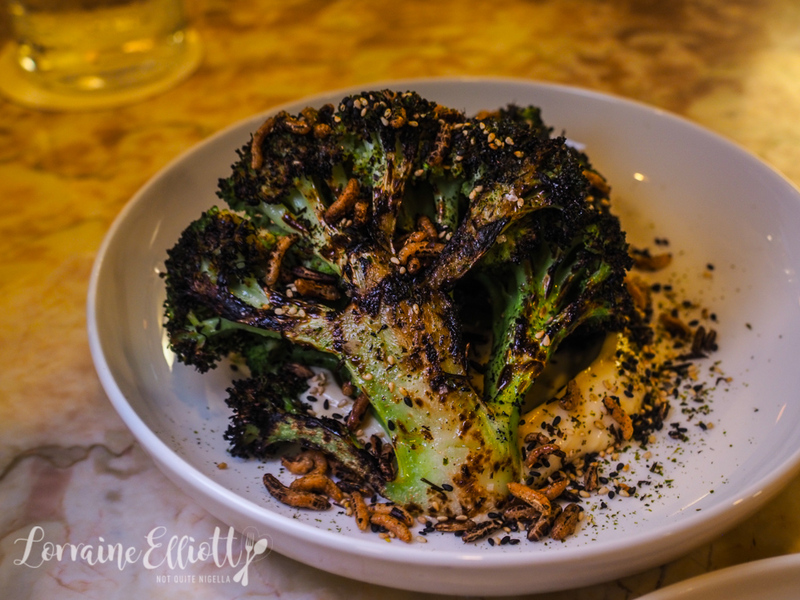 The large broccoli head is roasted and serves atop some tahini sesame emulsion and a crunchy wild rice furikake. And tip: dip the fries in this sauce! It's hard to choose one dessert so two it is for me before I sink into the tub! 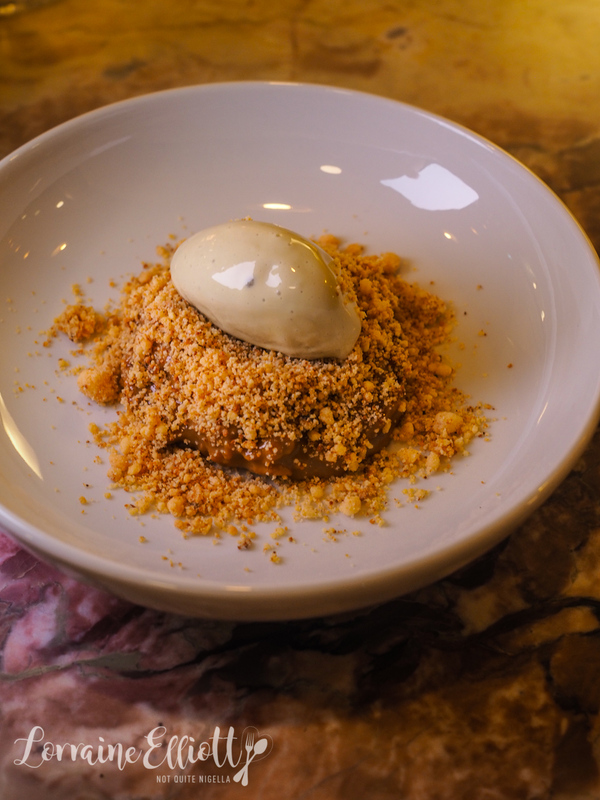 The first is an intense, rich and textural number with a toasted milk powder, a thick fresh dulce de leche made in-house and a quennelle of pistachio sorbet that tastes of real pistachios. But my heart was won over by the crema catalana. 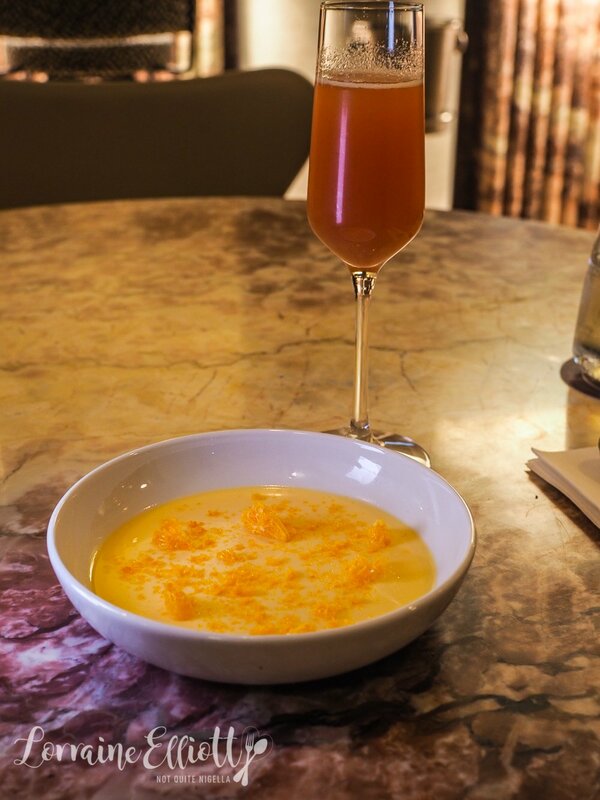 This citrus scented version of creme brulee is always a favourite choice of mine and this one has dehydrated mandarins in place of the brûléed top. And you know what? I don't miss cracking the top even though I thought I would. The silky custard really melts on the tongue and there is texture from the crunchy dehydrated mandarins on top. And to wash it down? A blush pink white peach bellini! After staying two nights, I'm sad to have to pack my bags and leave (I briefly consider stowing away on the not yet opened 6th Penthouse floor). 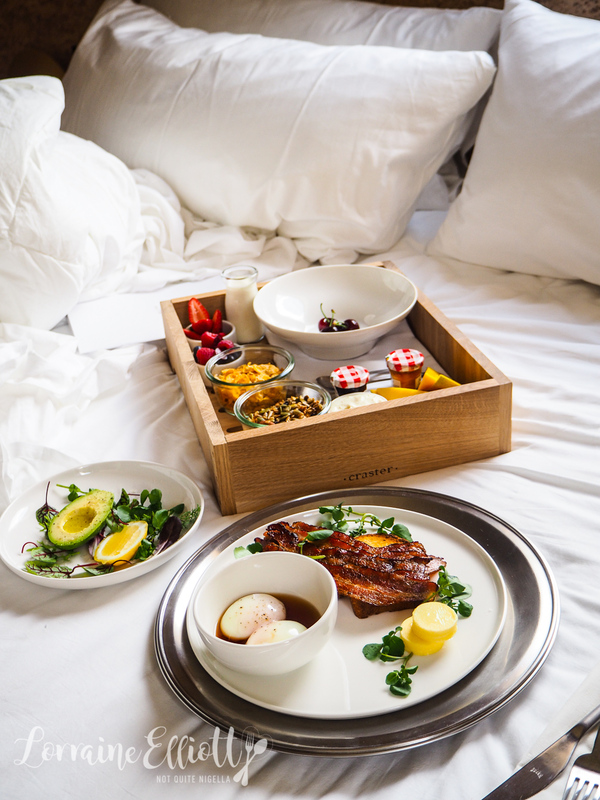 And for breakfast there's a little treat for me with breakfast in bed. There's a fruit and yogurt box with a gorgeously rich vanilla bean yogurt parfait, fresh raspberries, blueberries, strawberries and cherries. 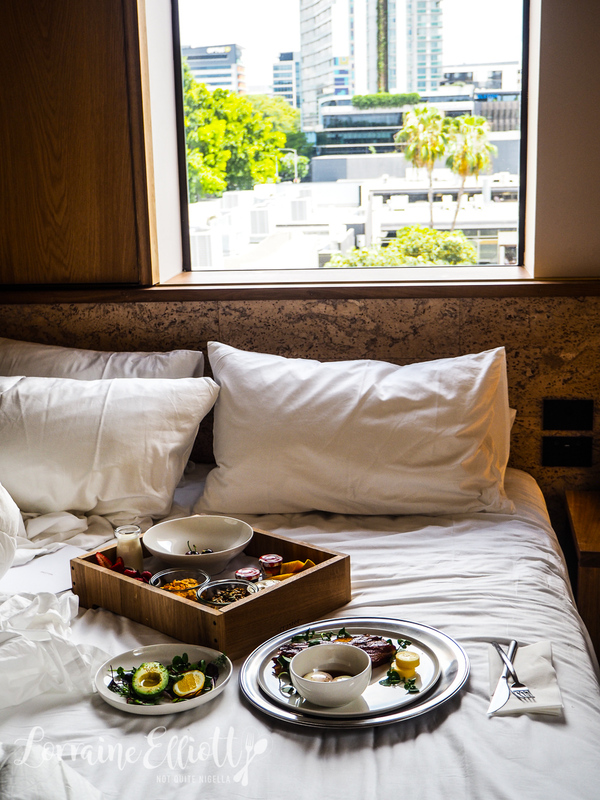 This comes with two types of cereal: cornflakes and house made toasted muesli and organic milk. This comes with a half avocado with olive oil and salad as well as two cute little brioche toasts with crispy bacon and two wobbly and delicious onsen eggs. I eat these while wearing my robe in bed. So tell me Dear Reader, which room colour would you prefer: pastel pink, blue or green? 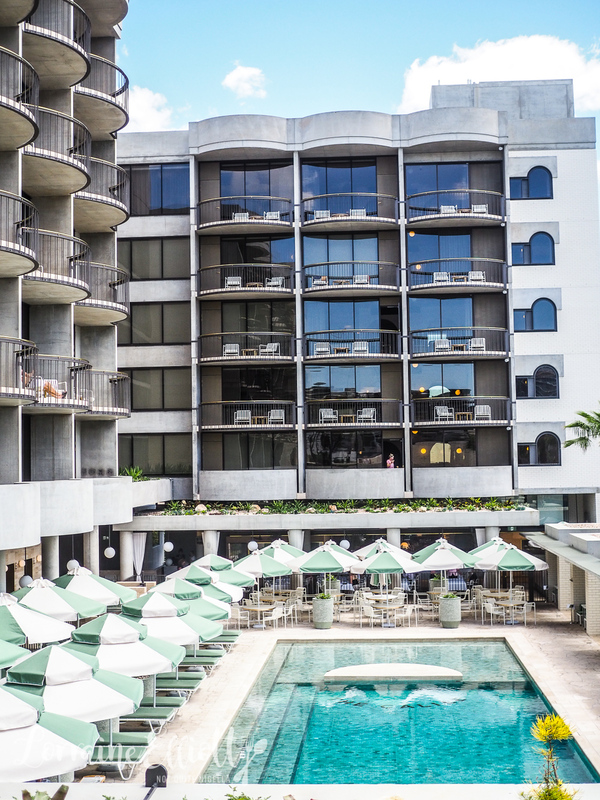 What is the most important thing that you look for with a hotel? 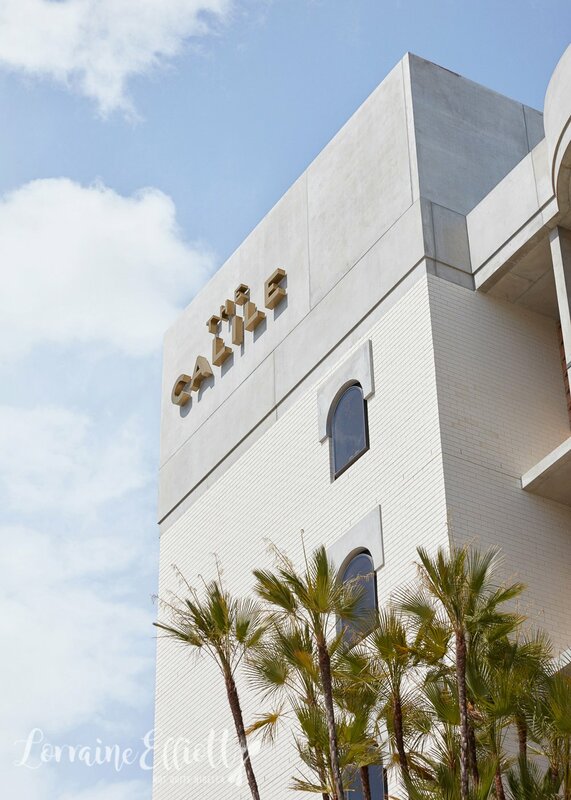 Have you ever stayed at The Calile? NQN stayed as a guest of The Calile Hotel but all opinions remain her own.